After decades of focus on the health care system, we have come to recognize that complex social factors have a powerful influence on our well-being. We see more clearly than ever that to improve the nation’s health, we must engage all sectors to improve population health, well-being, and equity. The Robert Wood Johnson Foundation envisions an America where we all strive together to build a Culture of Health—a culture that enables all in our diverse society to lead healthier lives now and for generations to come. To learn more about the foundation's vision for a Culture of Health, we invite you to explore www.cultureofhealth.org. In 2015, Alonzo Plough, PhD, MPH, chief science officer and vice president of Research, Evaluation and Learning at RWJF, introduced the launch of three signature research programs: Policies for Action, Evidence for Action, and Systems for Action. Learn more about RWJF's signature research programs. RWJF has developed an Action Framework to encompass the principles underlying the vision for a Culture of Health. This Action Framework will guide the Foundation’s grant making and strategic collaborations. As can be seen in the model, a Culture of Health will not be achieved by focusing on each action area alone, but by recognizing the interdependence of each area. Implementing the framework will take time and involve collaboration across multiple sectors – beyond the traditional public health field. It will call for new norms and expectations, knowledge and capacities, and practices and behaviors. It will require a commitment to equity and multi-cultural perspectives, and force hard choices about how to allocate limited resources in new ways. 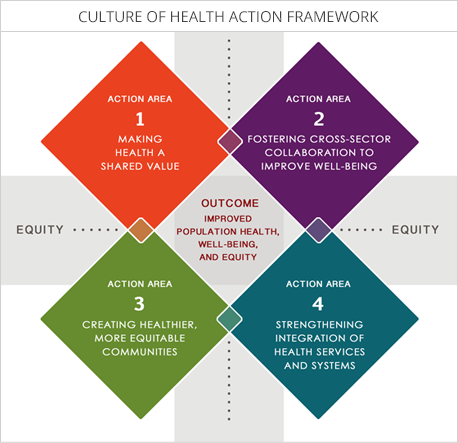 As we make progress in the four interconnected Action Areas, we believe that together we will improve population health, well-being, and equity. With the Action Framework as a compass, RWJF will work alongside others to develop, implement and advance efforts to raise the health of everyone to the level that our great nation deserves.